After a one day trip to Kodaikannal, it was rather disappointing to leave the fabulous cool weather and the lovely scenic beauty and head back to hotter plaines. I had kept my stomach rather empty as I suffer from motion sickness during hill ascents and descents. So on reaching the ground level I was really hungry. I had made my companions hungry telling them about the food served at Venu Biryani. So everyone was salivating by the time we reached the place. We reached the restaurant and had to wait for 20 long minutes before we got a seat. Inspite of waiting we could not get a table to seat our company of 20 people. So we sat down in groups of 6. Since we all wanted to have the special flavored biryani of Dindigul, we ordered one each.We chose the Mutton Biryani. 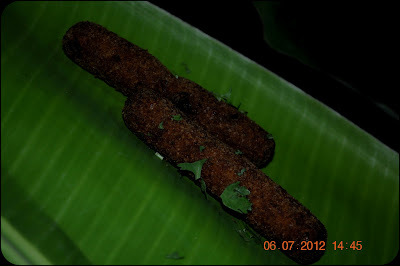 As the Kola Orandai we ordered initially was over, the waiter suggested to us the Kola Kebab Sticks, so we went with it. We also ordered Karandi Muttai for each of us and also picked other specialities like Brain, Netheli Fry and Chicken Chukka. Wow, what a spread we had ordered! The food was served in usual South Indian fashion on a Banana leaf. The service was really quick. Also the food was served piping hot. The company of people who were seated with me at the table, had never had anything from the Dindigul cuisine. This was their first experience with it. They went into raptures on tasting the delicacies. The Mutton Biryani, in spite of it being different from the biryanis which you get at weddings, was brilliant. 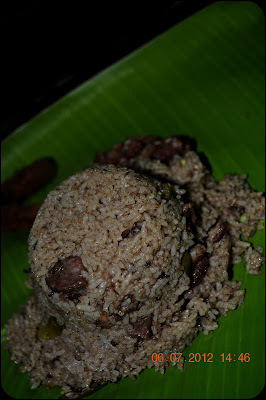 I have had Dindigul style biryani at restaurants in Chennai, but there seemed something different about this biryani. The taste was way better than what is served here in Chennai. I guess I will go with what my grandmother often exclaims "that its all about the water which used in the cooking and the hand craft or kai pakkuvam." While we were tasting our biryani, we were served with our side orders. My God! They vanished off the table in lightning speed. The tastes of Kola Sticks and the Karandi Muttais were phenomenal. Likewise the Brain and Chicken Chukka. While the Netheli Fry was just okay. By the end of the meal each one of us had consumed 5 Kola Sticks and 2 Karandi Muttai's each and also 2 Biryanis. The bill for the group present at our table was Rs 2198 /-. This bill amount was reasonable for the ridiculously large amount of food we had consumed. Please do not expect any ambiance here. You are here to relish the food and thats all you should do. Dindigal Venu Biryani is located in Poet Tyagarajar Road in Dindigal.